In anticipation for the October release of this classic hidden gem FINALLY coming to Blu Ray via Warner Archives, I thought I would dig out one of my favorite Laserdiscs in my collection. 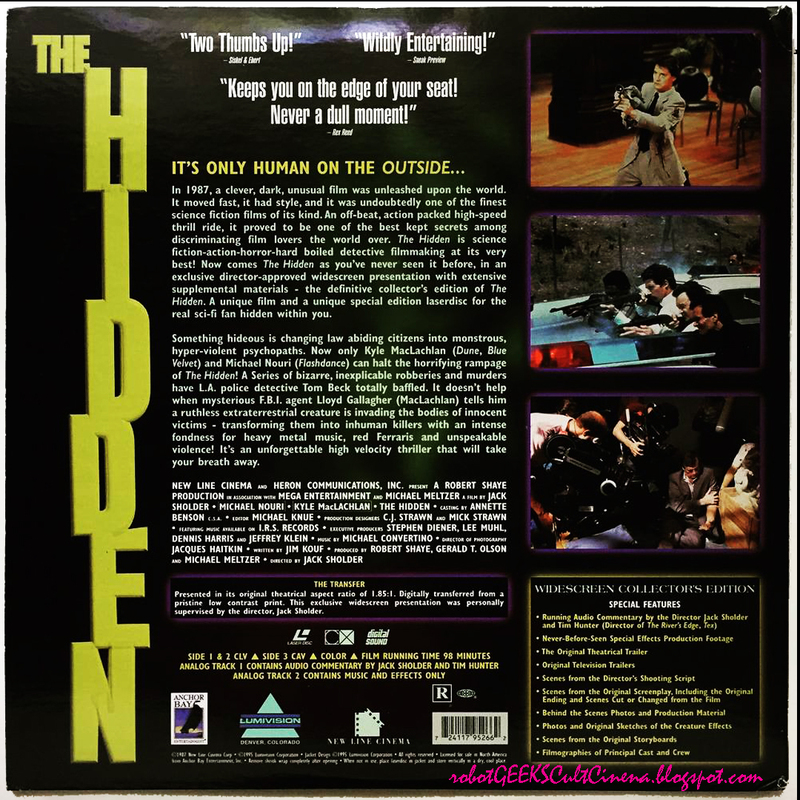 The Hidden was ultimately released twice on this format, the first being the basic Pan & Scan version, and then this Special Collectors Widescreen Edition, which was on 2 discs and came in a slick gate-fold style packaging with some really nice Special Features, something of a rarity with Laserdiscs. But just being available in widescreen in a step above VHS (which also had a widescreen release) was pretty badass back then. As you can also see from this specific edition, sometimes you just can't beat Laserdisc packaging or presentation. In addition to it's stellar packaging job, you get the best presentation of this film prior to DVD. 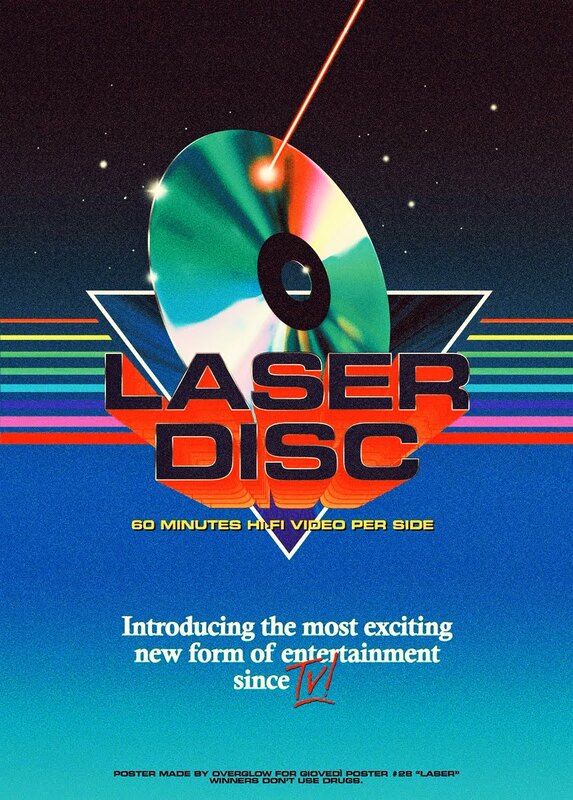 Even the DVD, which I own, isn't that much of an improvement over this Laserdisc. So the new Blu Ray coming out, despite not having much in the way of extras, should be a vast improvement in terms of quality. And who knows? Maybe if it's a hit and sells well they'll eventually do some sort of Special Edition down the road. I shouldn't have to tell you just how awesome this film is, because by now it should already be a favorite in your collection. If by some chance you've never actually seen it yet, well let me tell you. It rules. It rules so hard. Directed by Jack Sholder (A Nightmare on Elm St. 2: Freddy's Revenge) and starring Kyle MacLachlan in only his third film, after Dune and Blue Velvet and Michael Nouri (Hologram Man). It's a fun sci-fi/action/thriller made only in a way that the 80's could produce, full of stunts, action, thrills and a performance from MacLachlan that I can only assume David Lynch must have seen prior to casting him in Twin Peaks and based his Agent Cooper performance off of because they're so similar. Or it could just be a coincidence. What do I know? Sholder's slick and solid direction gives the film a much more professional edge than most in this genre, and despite the fact that this didn't get a wide U.S. theatrical release, you'd never know by watching it. It's got all the bells and whistles of any big budget studio film and it's a shame it didn't get the big release and attention it deserved to become a breakout hit, which it very well should have been. 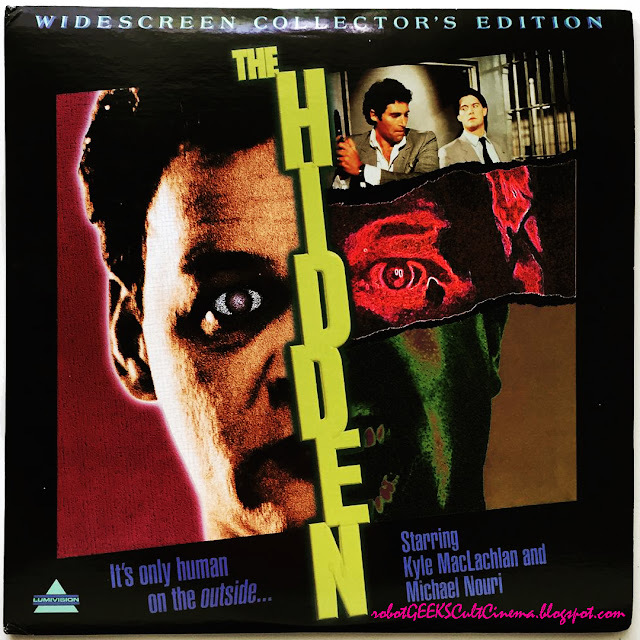 The Hidden Blu Ray's tentative release date is set for October 20th.